PRODUCT DESCRIPTION: Metered Insecticide, Purge III and Clear Zone are pyrethrin based aerosols which can be used in our Aerosol Machines. All three will kill and repel flies, mosquitoes, noseeums, biting gnats, thrips and small flying moths. WHERE TO USE: Restaurants and food processing plants, stores, farms, dairies, barns, kennels, factories, schools, hotels,motels, offices, ships, planes (cargo area), supermarkets, food warehouses,bottling plants, hospitals, nursing homes, day-care centers, milk and egg handling areas of dairies and chicken houses. RATE OF APPLICATION: These aerosol cans contain pyrethrin as their main active ingredient and should be applied using one of our Aerosol Machines. These dispensers work by activating the metered valve on the can so it will release a short spray of aerosol. The AEROSOL MACHINE 1000 is our biggest seller. It's super easy to set so you just need to keep refills in it fresh by changing them monthly and you'll be protected. The AEROSOL MACHINE 2000 has a photo cell so it can detect daylight. This way it can be programmed to "not" go off when its light and only when its dark or vice versa. The AEROSOL MACHINE 3000 has even more settings. It can be configured to skip certain days of the week making it ideal for use in sensitive areas. You can also turn up the frequency of "blasts" to as often as once a minute. No doubt this is an extreme setting but sometimes is needed – especially when trying to control outside pests around a patio or deck. Using an Aerosol Machine for problematic flying pests will provide noticeable results within one hour after a machine is turned on and activated. Keep in mind that such factors such as airflow rate, the size of the space being treated, humidity and the room temperature will affect insect activity and control. A good guideline to follow is to install one machine per 6,000 cubic feet of unobstructed space. 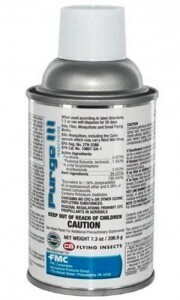 PRODUCT COMPARISONS: Purge III has been around forever and is the "Cadillac" brand therefore its price is the highest. 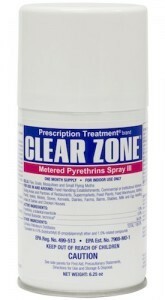 Clear Zone came out after Purge II many years ago and they made it with a .025 more pyrethrin so they can say its stronger but we cannot tell it works any better compared to Purge. Metered Insecticide is the option and though it has slightly less pyrethrin compared to Purge (.075 less), it has more synergist than the other two. More importantly, we cannot detect any difference in performance meaning all three options work equally well for the same targeted pests. For this reason, the Metered Insecticide is clearly a very good value due to the cost savings. WHEN TO CHANGE CANS: Any of the three cans offered will last at least 30 days when deployed to release a blast every 15 minutes 24 hours a day. So if you set your machine to go off every 30 minutes or less, refills will last longer. Is there a product for outdoors that fits the 1000 and 3000 dispenser's for patios etc. that may be a little stronger? Thank you either way. Sorry but not anymore. We used to have refill cans that contained more pyrethrin (1.7%) but due to worldwide shortages and rising prices, the highest % you'll find now is around .9% which is what you'll see the three products above contain if you check out their respective labels. Now as a suggestion, there are two ways to work around this limit. The first workaround is to get one of each refill can shown above. In fact all three contain slightly different % of active and though they tend to "perform" the same for most flying insects, there is a chance one might work "better" for your particular need. And if you identify one that seems to perform better, stick with it. The second option is to simply install more machines. So instead of having 1 machine for an area, set out 2. No doubt this will "double" the amount of product being used in this given area and doing this would be the equivalent of using something that is twice a strong as the .9% pyrethrin. Per your suggestion in another post, I purchased the 1000 dispenser and purge III for my indoor problem with thrips. So far it has been very effective and I hope a month of this will be enough to eradicate them BUT the slight odor is really bothersome. Do either of the other aerosol insecticides have less lingering odor? Of the 3, the Metered Insecticide will have the most odor. Its actually still considered to be a "low odor" aerosol but we have found that maybe 3-4 people out of every 10 using it might be able to notice it. The Purge would be next in odor strength with maybe 2-3 people of every 10 saying they can detect its presence. Lastly, the Clear Out would have the least amount of odor with only 1-2 people of 10 saying they can detect it. So at this point, since you've been using the Purge, I would say to try the Clear Out next time. But there is another option if you find the Clear Out is too strong. You see, these same machines can be fitted with another aerosol we carry called Odor Eliminator. This refill is used to remove malodor. Basically it "eats" any kind of odor including those from insecticide. And we have customers using this setup in rooms where they also have the Purge (or one of the other refill options) being applied by the machines. The net effect is an odor free room thats also being treated for pests. True, you will have to purchase more machines, but this option works well and if you find the Clear Out refill is too noticeable, give the Odor Eliminator a try. I have a "plant" room in my basement, roughly 15' x 15'. I over winter a lot of plants, and start new ones. I have a huge problem with whiteflies, as in completely covering some plants and having clouds of flies if you bump into one, but I rarely notice any other types of insects. What product would be best to control the whiteflies (and spiders, but that's just because I don't like them), but not make it impossible for me to work in the room from the smell? Thank you! Hi! I'm having a really bad problem with noseeums in my home. We've been dealing with their bites for over a month now. I live in Hawaii so it's really humid and can't set my AC below 72. I have 3 kids age ranging 8 months to 6 years old…. Which of the 3 aerosol sprays would you recommend? I live in a 1600 sq ft home- how many dispensers would you recommend? Please keep in mind my youngest is only 8 months. Thanks! No doubt our machines will help. They're ideal for use in the home and once configured, treatments will be done around the clock so you don't have to worry about anything. Just be sure to change the can every 30-35 days and you'll be covered. The quick 1/2 second release of pyrethrin is hard to notice and if you go with the Clear Zone, you won't detect anything because its pretty much odorless. And did I mention safe around people and pets? In fact you can use it in dining rooms, breakfast rooms and even the kitchen. The only rooms I wouldn't install them in would be for the kids 10 years old or younger. As for how many machines to get; install one for every 400 sq/ft. That would be one machine for every 20 ft by 20 ft room. Most homes will need 4-6 machines but it really depends on how many areas you have to protect, where the main problem is focused, etc. Send us an email with more specifics of the homes layout in case you need further help but no doubt 4-6 will usually solve any problem; less will be needed if its only 1-2 rooms with activity. My bedroom is 10 x 12. I live in a rooming house and nets are everywhere. The guys always leaving doors open when they go out. Bugs come in. So I'm just going to get one for my room. I wonder, with nets which one of your units will be good to get? I was thinking the 3000 cause different settings, operate around the clock and the 1000 works all the time. The 2000 has a light photo sensor, where you have to program it for daylight or night time. I want to kill them quick and get rid of them. Also your pesticide for the machines, which one be the most effective? You are right in that the 3000 has a plethora of settings so no matter what you want it to do, it can set to perform as you desire. And in some cases, setting it to go off every 5-10 minutes is needed (for bad insect issues) which you can't do with the 1000. Plus, the 3000 will let you program it to be off for a few hours and then on and then off again as is needed so I'd go with that machine given your situation. As for which refill to get; the basic difference with the Metered Insecticide vs the Clear Zone is that the Clear Zone is odorless and usually the best option for inside the home – especially a bedroom. Side by side, the Metered is best suited for basements and garages so for your needs, I suggest the Clear Zone. On a side note, remember that a can is good for 30 days when set to go off every 15-30 minutes. So for your situation, you may find a single can only lasts 2-3 weeks if you have the machine set to go off every 5-10 minutes. Is there such a thing as a pyrethrin candle? Does it kill pantry moths? Is it safe around birds? Yes and yes. If you review the label (link is above), you'll see it's labeled for use in sensitive areas like hospitals, supermarkets and even schools. Any product labeled for use where food is being prepared for human consumption means the amount being introduced is not significant enough to impact the food or the people eating it. Remember, only a .5 second release of the active will be released every 15 minutes which is very little chemical. And though its highly active on flying pests like flies, mosquitoes and moths, it's not nearly strong enough to impact birds or mammals. So if you have a bird seed moth problem and plan on installing some machines to kill off active adults, this could be a method used to get rid of them. By killing off the hatching adults, you'll be preventing new eggs from being laid which in turn will break their cycle. Regarding my question about pantry moths and birds. Which is better to use, the metered insecticide, purge 3 or clear zone with the aerosol dispenser? For sensitive areas, the Clear Zone is best suited since its odorless. I had gnats so bad it was embarrassing. With 4 dogs, 3 kids and a grandchild still in diapers, it was a losing battle. I ordered the Clear Zone and the sprayers and in (I kid you not) 48 hours all my gnats were GONE! Great Stuff! @Desiree Dedeaux: Great to hear! Nothing more annoying than small gnats flying around everyone. Seems to be working! Haven't seen any moths for a couple of days. Life changing product! If you have gnats so bad that you actually inhaled a few, I was in the same boat. I thought nothing would get rid if these pests. Then I ordered this in a last ditch effort. IT WORKED, in 24 hours my gnats were handled. Good luck…but you won't need it with this stuff. My Question is, (Do you have a fogger-aerosol-dispenser-for your phantom products)? Sorry but no. Phantom is a "residual" type product and as such, is only limited to crack and crevice applications which are manually controlled. Good stuff! My gnats are almost gone. I brought several plants inside for the winter and they're spread around the house. Since starting the Clear Zone, they are almost gone (two weeks) and I have never smelled anything. Very glad I bought this spray and the dispenser.